If you celebrate with metallic balloons, remember to keep them tethered at all times and dispose of them properly. Proper handling and disposal keeps them from drifting into power lines and causing a power outage. 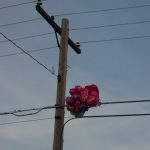 When a metallic balloon touches a power line or floats into substation equipment, it can cause a surge of electricity that short circuits equipment and can lead to power outages, fires, and possible injuries. Keep balloons tethered at all times and attached to a weight. When no longer in use, puncture and deflate the balloons before creatively reusing or disposing of them. If a balloon or another toy becomes entangled in an overhead power line, do not attempt to retrieve it. Call your electric utility for assistance. Always assume power lines are live, and keep yourself and all other items at least 10 feet away from power lines.